Are Skylights Right for Your Home? Many homeowners decide to add skylights to their roofs to get more exposure to natural light, especially if the home is located in an area that gets lots shade because of the tall trees surrounding the building or for other reasons. Skylights are commonly installed by Denver roofers to make bathrooms, kitchens, bedrooms, and attic rooms brighter, but some buildings use them to let natural into the staircase as well. The most important benefit of Denver roofer installed skylights is obviously the penetration of natural light that makes any room friendlier and more attractive, but homeowners contemplating to install skylights must be aware of a few cons as well. 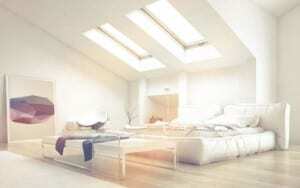 One of the biggest disadvantages of skylights is their relatively low energy efficiency. While roof windows let light in, they also permit thermal exchange between the room and the home’s exterior – in other words, your skylight will let heat come in during the hot summer months and warm air leave in winter. The other aspect that you need to know about before you start shopping for the best skylight is that skylights are prone for generating condense in the room they are installed in – when the warm air in your room touches the cold window in winter, the process causes condensation that can manifest either in the form of damp patches around the window or a droplets of water on the wall.